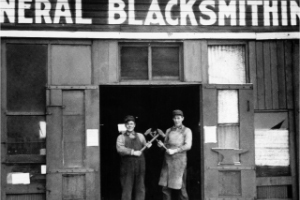 In 1902, Carl Frederick Malzahn, a German immigrant seeking to escape the harsh winters of Minnesota, moved his family to Perry, Oklahoma, and opened a blacksmith shop with his sons, Charlie and Gus. 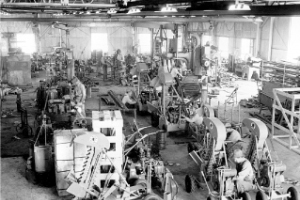 The business prospered, and several years later, with the advent of an oil boom, it became Charlie's Machine Shop, specializing in repairs for the nearby oil fields. Young Ed Malzahn, Charlie's son, learned from his elders the process of adapting a business to meet changing demand. In the late-1940s, he began to apply his mechanical engineering degree to a device that he believed would be in great demand once it was produced. At the time, the process of installing residential utility services—electric, gas, and plumbing lines—involved slow, tedious pick-and-shovel labor. Ed Malzahn's idea was to create a compact trencher that would dramatically reduce the time and effort of this process. 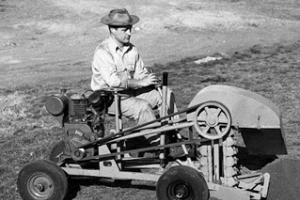 Working together, Ed and his father spent months in the family machine shop creating the prototype of what would be known as the DWP, which stood for Ditch Witch Power. Now known as The Charles Machine Works, Inc., Ed Malzahn's organization remains a leader in the industry it essentially created. Still based in Perry, Oklahoma, the company designs and manufactures a wide variety of high-quality underground construction equipment: trenchers, vibratory plows, pneumatic piercing tools, backhoes, electronic guidance and locating tools, horizontal directional drilling systems, drill pipe, downhole tools, vacuum excavation systems, excavator-tool carriers, and mini skid steers. Even after achieving household-name status in the worldwide construction industry, the Ditch Witch organization remains true to its roots: family and community. Ed Malzahn has handed over CEO duties to his granddaughter, Tiffany Sewell-Howard, who represents the fifth generation of the Malzahn line—beginning with Ed's grandfather Carl—to run the family company. The company's extended family includes the residents of and around the town of Perry, population around 5000. 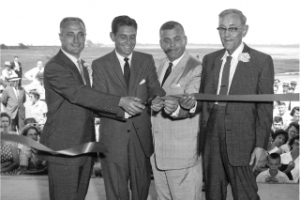 Since the early 1950s, hundreds of Perry-area residents have started and had life-long careers on the expansive campus that contains the company's 30-acre manufacturing plant and training, testing, research and product development facilities. 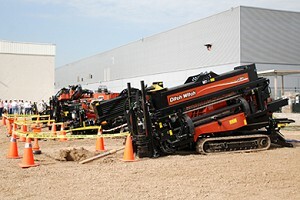 The Ditch Witch plant employs more than 1300 people. While the temptation is great to reduce manufacturing expenses by exporting those jobs overseas, as many companies have, the Ditch Witch organization is committed to providing American-made products. The Charles Machine Works Inc. is an ISO-9001 Quality Systems Certified manufacturing facility covering more than 23 acres, the Ditch Witch manufacturing plant features a variety of innovations that help enhance both productivity and performance. 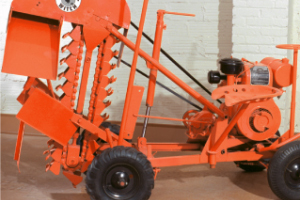 Ditch Witch products are an important part of the history of American industry. The Ditch Witch compact trencher has twice been named "one of the 100 best American-made products in the world" by Fortune magazine. In 2002, American Society of Mechanical Engineers (ASME) President Susan H. Kemp awarded the Ditch Witch organization a bronze landmark plaque. More recently, The Travel Channel recently recognized the company's dedication to homegrown products by featuring the Ditch Witch manufacturing facility on its program Made in America, hosted by John Ratzenberger. The original Ditch Witch trencher became a permanent part of the new Oklahoma History Center in Oklahoma City in 2005. But the trencher's inventor, Ed Malzahn, who was inducted into the Oklahoma Inventors Hall of Fame in 2004, isn't exactly ready to be a museum piece. The embodiment of the durability of the machines he pioneered, Malzahn serves as an inspiration to future generations of innovators. In 2001 Ditch Witch opened a European Support Centre in Barcelona, Spain to cover Europe, Africa and the Middle East The facility is 6,500sq/ft with offices, training centre, parts department, and also has 16,250sq/ft of demonstration land. Ditch Witch International Barcelona holds stock of equipment for dealers to purchase provides numerous Sales and Service Training Schools and Customer Events through out the year.